TouchNTuff Polyisoprene Gloves. Comfortable latex free polyisoprene. 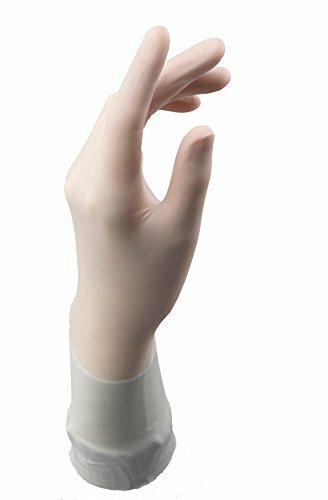 For workers in aseptic and clean environments, the TouchNTuff synthetic polyisoprene glove is engineered to deliver all the performance of natural rubber latex minimizing the risk of latex sensitization. Produced on new, ergonomically-designed hand specific formers to enhance fit and comfort and to reduce hand fatigue and stress. As this glove is made from non-latex polyisoprene, wearers experience a more secure fit that provides greater comfort. Does not contain Natural Rubber Latex. Made of 100 percent synthetic polyisoprene and minimizes Type I allergy for latex-sensitive manufacturing and laboratory professionals. Ansell SureFit Technology eliminates cuff roll down. By maintaining the glove securely around the arm, Ansell SureFit Technology provides workers in Life Sciences with more protection during routine lab work and manufacturing by ensuring the efficacy of the gloves as a barrier protection. Ansell’s proprietary inner coating technology enables ease of dry and wet hand donning. Design and thickness allow for easy and comfortable double-gloving. Anti-slip finish helps prevent slippage and designed to provide a great degree of grip. Adit standards: manufacturing facility registered to ISO 9001, ISO 13485 and ISO 14001. Quality control: compliant with ASTM D 3577, Type II. Glove design: hand specific and smooth finish. Long glove with a beaded cuff. Gamma radiation: sterility assurance level. 8.3 mil Thickness. Size 9. White color.